Missiles were rained on Syria by the US, UK and France without any credible reason and with no international sanction. In an article published in The Wire on April 9, I had expressed deep foreboding that, with the American century in its twilight years, the danger of war being used by weak, confused Western leaders as a distraction from the terminal decline of their global hegemony had grown exponentially. Hours after it was published, the US and UK accused the Bashar al-Assad government of launching a gas attack on the last rebel stronghold in Ghouta, the once verdant but now heavily populated oasis that adjoins Damascus. Four days later, the US, UK and France fired 105 Tomahawk missiles into Syria from ships scores of miles offshore. This attack reflects, in microcosm, every facet of the breakdown of order and reversion to a barbaric, ‘State of Nature’, that is dragging the world ever closer to War. Trump knew within minutes of the attack that ‘Animal Assad’ was responsible, so he warned that “missiles are coming”. Their self-satisfaction after the attack was equally odious: It was a ‘precision’ attack. It was 100% successful. 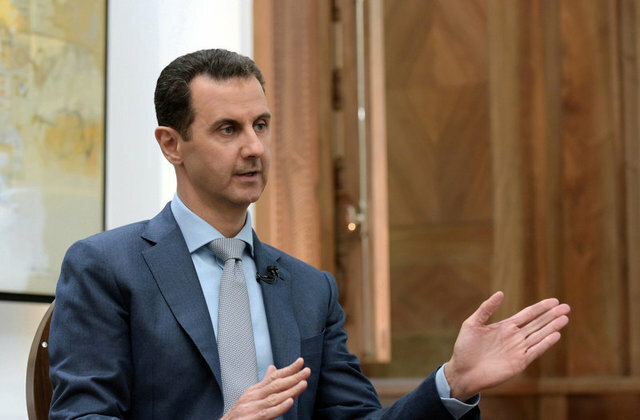 Three known Syrian chemical weapons production sites were destroyed. There had been no civilian casualties. Syria had been taught a lesson. The West had upheld international law. These is something obscene about this haste to condemn; to affirm the right to bomb and kill without provocation, without conclusive proof of wrongdoing, and without any prior sanction from a quasi-juridical body like the UN Security Council or General Assembly. It shows a contemptuous disregard not only for the international law enshrined in charter of the United Nations which the US itself largely drew up, but a disdain for the moral principles upon which civilisation itself is founded. While the Syrian army was an obvious first choice in any search for culprits because it was in the process of cleaning out the last remaining rebel stronghold in Ghouta, Russia, which has a Reconciliation Team on the ground that has been supervising the evacuation of civilians from Ghouta through three humanitarian corridors, has not only dismissed the accusations as ludicrous, but claims it has evidence that it was a false flag operation actually instigated by the British. It was, therefore, all the more essential to wait for a detailed examination of the site of the alleged attack by experts. A team of experts from the Organisation for the Prohibition of Chemical Weapons (OPCW) had already arrived in Damascus and was scheduled to hold its first meeting with the vice-foreign minister Feisal Mekdad, on Sunday, April 15. So what was the urgency that made the three countries decide to fire 105 Tomahawk missiles into Syria the previous night? There is one possible answer: the strong likelihood that the OPCW might not endorse the conclusion that there had been a gas attack, or that the Syrian army had made it. This, according to Pulitzer Prize-winning journalist Seymour Hersh, had happened once before already: Two days before Barack Obama was to launch a devastating missile attack backed by B-52 bombers on Syria in August 2013, the British Chemical and Biological Weapons Research Centre at Porton Down had informed Prime Minister David Cameron that the Sarin gas used in the August 21 attack could not possibly have come from the Syrian army. In Hersh’s words “analysis demonstrated that the gas used didn’t match the batches known to exist in the Syrian army’s chemical weapons arsenal”. This was the reason why Cameron decided at the last minute to refer his decision to the parliament, and Obama called off the strike a few hours later. 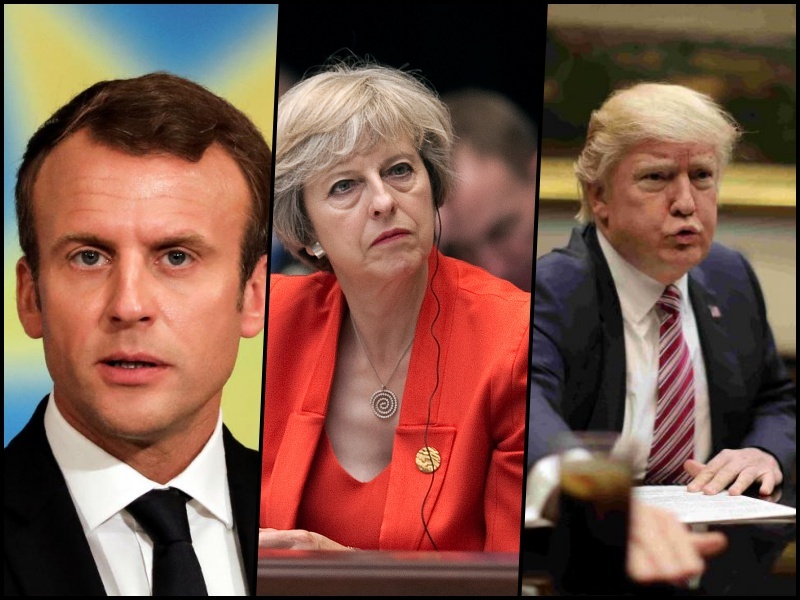 Macron is still a relative newcomer to the twisted power game going on in the Middle East, but the need to avoid another Iraq-sized blunder should have made at least the British and American governments pause and make doubly sure that they were doing the right thing. The fact that neither government chose to remember Iraq shows that the attack wasn’t about punishing Syria at all. This assessment, which is widely shared in the US and been expressed with withering elegance by Jeremy Corbin, the leader of the Labour party in the UK, explains two other anomalous features of the assault: First, if Syria had chemical weapons complexes and supply depots operational in 2018, how did the OPCW certify in 2016 that Syria had destroyed all of its chemical weapons and its manufacturing facilities? If its experts were not fooled, (or bribed) how had Syria, which has fought, and been bankrupted by, the most vicious and brutal war in recent history, managed to rebuild even a rudimentary chemical weapons capability in just two years? Could it be that Russia has given them the plants/laboratories? Or China? or Iran? Sensing this absurdity, a source in the US government has pointed the finger of suspicion at that other member of the Axis Of Evil, North Korea, by leaking a so far confidential UN report on it’s violation of UN sanctions to the New York Times. This report detailed a brisk trade that North Korea was doing in chemical plant equipment with Syria. It reported that there had been 40 shipments to Syria of acid resistant tiles, valves, thermometers, and other equipment that could be used to manufacture chemical weapons. But as one American commentator pointed out in an article in the paper’s online edition (now deleted), these are used in many other chemical industries. In fact, a similar finding of dual use capability had briefly blocked even the import of lead pencils by Iraq in the nineties on the grounds that the graphite in them could be extracted and used to manufacture the heat shields of missile cones! There could, in fact, be a more innocent explanation for these purchases: By 2012 (when I visited Syria) rebel attacks targeting Syria’s chemicals industry had almost wiped it out. The principal target had been its pharmaceutical sector, possibly because the same equipment could also be used to produce chemical weapons. As a result, the shortage of life-saving medicines had become so acute that WHO had launched a world-wide appeal for funds to supply Syria with these medicines. But so complete was the demonisation of the Assad regime by then that it was able to raise only $60 million. The Syrians could not have forgotten this. So it would have been surprising indeed if rebuilding the pharmaceuticals industry had not been one of the first tasks the government undertook after regaining control of central Syria. The second anomaly is even harder to explain. In the reams of reporting and opinion-making not one commentator has raised the question of motive? In murder trials, the absence of motive is the single greatest obstacle to proving guilt beyond reasonable doubt. Why then has no one asked what Assad could possibly have hoped to gain from launching a single chemical bomb or rocket at an already beleaguered remnant of a rebel force in the last stronghold it still held in Ghouta? By the end of March, Assad had regained control of all but one last rebel stronghold in Ghouta. A tally kept by the Syrian Red cross (Red Crescent) and the Russian Reconciliation Centre showed that 1,166,644 civilians, well over half of its population, had left Ghouta through the three humanitarian corridors created by Syria before the gas attack. These included thousands of rebels, their families and sympathisers. What need was there for him to risk all by using one lone chemical warhead now? “The real reason for the attack threats is probably this: Midterms (elections to the Congress and the Senate in the US) are approaching, the Russia investigation ( of tampering in the US elections to put Trump in power) is escalating and former FBI director James B. Comey’s book is being released. Research shows that diversionary wars — wars started to distract the public from domestic unrest — are hard to start in democracies and rarely have the intended effect. Military operations in an already existing conflict are much easier to manipulate — and are not as risky as starting a war. Since the attack was limited, no civilians were apparently killed, and no Russian and Iranian personnel killed or assets destroyed, there have been no repercussions. But Russia has warned the US and its NATO allies that if any of its assets in Syria are attacked, it will not only destroy the missiles in the air but also their launch platforms. That means the US naval task force in the Mediterranean. For the next eight months therefore, and possibly for the two years after that as well, the world will continue to teeter on the edge of a world war. Iran– Do Israel and saudi Arabia have a backup Plan ? 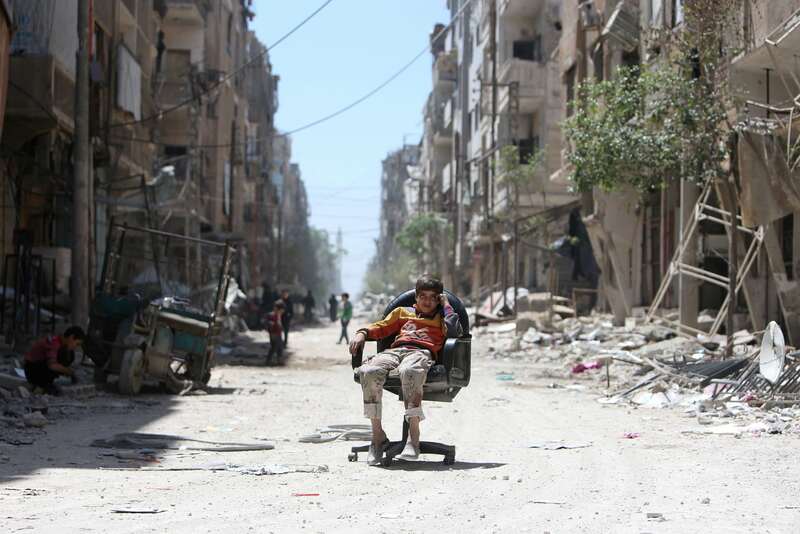 Syria – Who fired the first shot ?